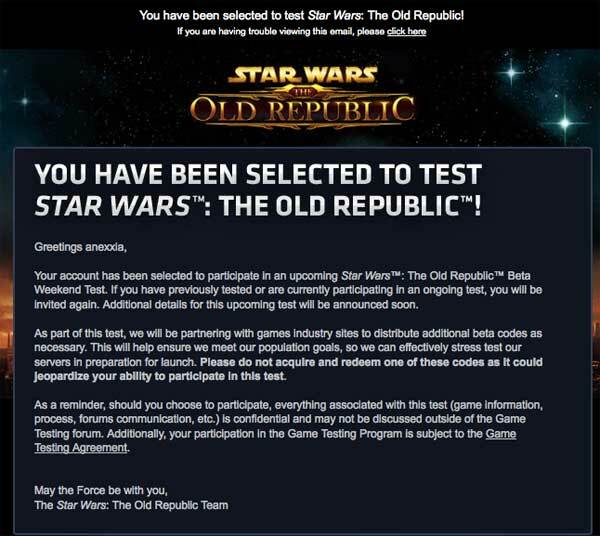 Like a million and a half others who signed up to test Star Wars: the Old Republic, I did a little happy dance when I received the BETA invite email. Turns out, they’re inviting all comers to help out in a nice big pre-launch stress test BETA weekend in the next few weeks. Of course, I was really hoping to have gotten an invitation for this weekend, but c’est la vie. I’m looking forward to getting a sneaky peek at the game this way, before the early access kicks in. In other news, I couldn’t resist picking up the Star Wars The Old Republic Hardcover Atlas: Prima Official Game Guide via Amazon, to be released w/release day delivery on 12/20. I had the World of Warcraft game atlas when I started playing WoW back in the day, and found it to be an invaluable reference. Yes, I am sure that given the many blogs and Wikis and fansites out there, soon enough all of its information will be spread across the Internet for free, but there is something awesome about having a game world atlas to reference.